In the mid 1970’s to the early eighties, I coör­di­nated a very inter­esting docu­men­tary art program for the National Park Service. The program had been going on between the New York Society Of Illus­tra­tors and the Park Service in Wash­ington D.C. I had received word that they wanted to include a profes­sional art society on the west coast into their program “Artists In The Parks.” A parks offi­cial flew out from Wash­ington D.C. To meet me, discuss the program and their needs. Fortu­nately our Society Of Illus­tra­tors was having an annual exhibit in the lobby of the Crown Zeller­bach Building at the same time. After having wined and dined him I took him to see the illus­tra­tion exhibit. He was very impressed with the caliber of talent in the San Fran­cisco Society Of Illus­tra­tors. Two days after he flew back I received a phone call. “We were now part of the program.” I was asked to assign those artists willing to travel and partic­i­pate in the program to a national park or monu­ment in the U.S. Upon their return an artist would produce one or two paint­ings with complete freedom to express their inter­pre­ta­tion of the park visited. One assign­ment I had included trav­eling to Glacier Bay National Monu­ment, Alaska and Klondike National Historic Park in Skagway. Skagway Alaska in 1976 was a quiet village, tourism was minimal. In a conver­sa­tion with one of the resi­dents upon my arrival, I told him my purpose for being there. He imme­di­ately suggested an after­noon excur­sion to my wife and I. Our guide offered to take us to a ghost town called Dyea, site of the starting point for the gold prospec­tors in the 1898 Yukon gold rush. We accepted his offer and found ourselves bouncing over an old dirt road in his truck for miles. We climbed up and over a moun­tain until we came to a spot where the road ended. ” Now we have to hike in the rest of the way”,Our guide said. My wife and I looked at each other with appre­hen­sion. The only thing visible was thick brush and heavy timber ahead. I told my wife I would fall back behind her and our guide as we hiked in, as a safety measure. Was this guy for real or had we accepted a ride from a possible Klondike mass murderer? The thoughts went through my head. After about a half mile hike through mosquito infested brush we suddenly came into a clearing. There before us were a number of old deserted cabins from the 1898 gold rush. Many cabins still contained remains of furni­ture and some uten­sils on the tables. We saw an old grave site with sixty head stones This was at the base of the steep Chilkoot ice steps that the miners climbed on their way to the gold fields of the Yukon. As the story has been told the miners waited for days to climb the ice steps single file burdened down with all their gear. On one occa­sion one slipped and fell bringing the others down with him resulting in the deaths of sixty miners, All now buried in that grave yard. After safely returning that after­noon to Skagway, we reflected on what we had expe­ri­enced. I now had much refer­ence mate­rial to complete my commis­sion for the park service. It was truly a walk into history . 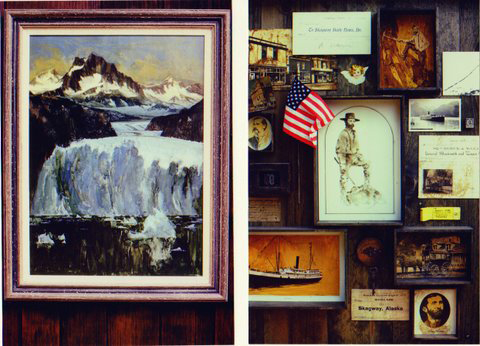 Many illus­tra­tors that trav­eled to various national parks and monu­ments had their own adven­tures and completed a wonderful series of paint­ings for the U.S. National Park Service.